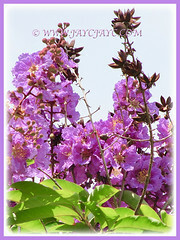 The Queen’s crape-myrtle is a free-flowering tree with enchanting flowers. 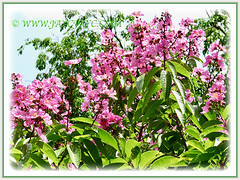 Excellent as a landscape plant with large clusters of colourful blossoms in bright pink or lavender to purple. Truly an impressive tree that’s often seen along the sidewalks. 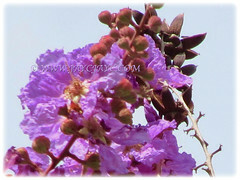 Botanical Name: Lagerstroemia speciosa (syn. 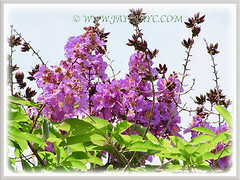 : Lagerstroemia indica, Lagerstroemia flos-reginae, Munchausia speciosa). 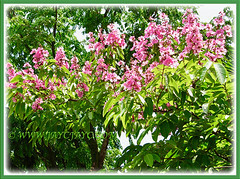 Common Name:Giant crape-myrtle, Queen’s crape-myrtle, Queen’s Flower, Pride-of-India. Origin: Native to China to India, Southeast Asia and Australia. It is widely cultivated worldwide. 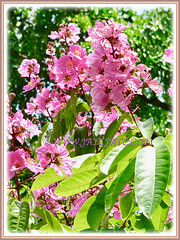 Features: Lagerstroemia speciosa is popular species belonging to the genus Lagerstroemia that consists of about 50 species of flowering plants. 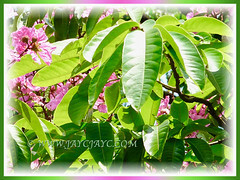 It is a small to medium-sized tree, growing between 10- 20 m tall, with smooth and flaky bark. It has an upright growth habit and multi-trunked. Its simple and entire leaves are oval to elliptic in shape, 8–15 cm long and 3–7 cm broad, with an acute apex. It is arranged opposite along the stems. It produces flowers in erect and dense panicles, 20–40 cm long. Each flower has six white to purple petals, measuring 2–3.5 cm long. These prolific flowering trees are beautifully coloured, bearing terminal inflorescences of large bright pink to lavender and purple flowers. The flowers will eventually be followed by round and woody fruits that split into five parts when ripe. 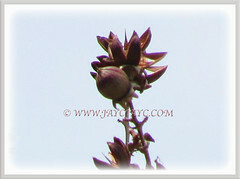 Culture (Care): Lagerstroemia speciosa or Okra grows easily with least maintenance. Moisture: Moderate water requirement. Water regularly. Soil: Sandy, loamy, alkaline and well-drained soils. It is not salt-tolerant. Highly drought-tolerant. Others: Pruning is not necessary since the tree has an upright-spreading habit of growth. Nonetheless, remove some of the lower branches of young trees that are growing at the roadside to facilitate the passage of pedestrians and vehicles. Feed once monthly, otherwise the leaves become chlorotic. Generally free from serious garden pests and diseases. However, watch out for aphids, scale and sooty mold. It is also widely cultivated as an ornamental plant in tropical and subtropical areas. 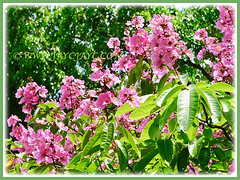 A deciduous tree that produces showing flowers and blooms usually once in a year at the peak of summer. A hardy and resilient tree that will tolerate storms well, having hard wood with flexible branches. Water regularly and protect it from frost. Feed regularly, otherwise the leaves become chlorotic. Propagation: Easily from seeds that germinate readily. Can be propagated from cuttings too. 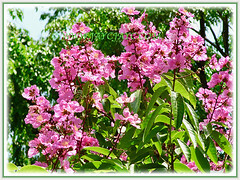 Usage: Lagerstroemia speciosa or Queen’s crape-myrtle with its ornamental flowers will be excellent as a landscape tree, along roadsides and highway median. Ideal as a specimen tree at parking lots to provide some shade.It is often planted both privately and commercially as ornamentals. The wood is used for railroad ties and construction in India. The leaves and other parts are used widely in the Philippines, Taiwan and Japan as a tea preparation. In Vietnam the plant’s young leaves are consumed as vegetables, and its old leaves and mature fruit are used in traditional medicine for reducing glucose in blood.